Governments may use increasingly complex and sophisticated tools for censoring unhelpful information but the end result is always the same, despite the claims of toadying journalists. It is easy to feel that what appears to be a recent tide of encroachment on the freedom of the press is merely business as usual in the realm of nations subject to the ebb and flow of more or less repressive governments. Even though this is ineluctably accurate, the post-Snowden environment puts the usual tactics in different areas of the world under a particular focus. It is common for these encroachments to occur most frequently when at war. The war does not have to be against another nation. The enemy within, a shifting and malleable distinction, will do just as well. In a world where half the hemisphere is engaged in a war against a noun—Terrorism--even this shallow pretext is almost unnecessary. To see how much these tactics are very much unchanged despite years of what may be perceived as intellectual progress in the fourth estate, one need look no further than George Orwell’s 1946 essay, ‘The Prevention of Literature’; stimulated in part by the recent wartime strictures of reporting and partly by the acquiescence of the British left to a self-censorship or denial of utilitarianism that allowed them to indulge in a fantasy that the Stalinist propaganda emerging from Russia was to be counterbalanced by a publication by the Soviets of the truth when the ‘crisis’ was over. In it, he described an attitude that chimes with some resonance with the response to Snowden and others on a personal level. 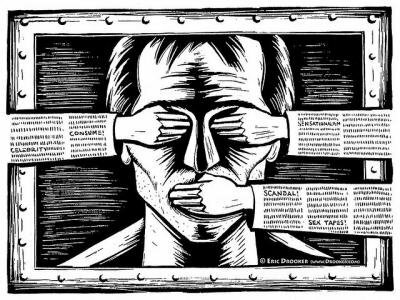 There are three types of censorship that restrict the freedom of the press. The first is a blatant characteristic of the straightforward out-and-out totalitarian regime as practiced in China (although this is beginning to change) or North Korea - a complete ban on all un-licensed reporting that is filtered through a bureaucracy that can close down a paper or arrest a journalist without any justification beyond the state’s desire. The second is the self censorship forced on journalists by law, bureaucratic regulation, and politically motivated criminal investigations as in Russia. This is the unkindest cut of all but at least allows journalists to do all they can to find more inventive ways of coding the truth into oblique but clearly understood satire that tests the very limits of the repressive laws. The same is true of censored literature, although the fact that repression produces great books (Bulgakov’s Master & Margarita et al) should not be a reason to perpetuate the habit.